William H. Machen is Toledo’s earliest known artist. Thanks to him, we have paintings of how Toledo looked in the very beginning. He painted the Stations of the Cross for St. Francis de Sales Chapel, located downtown on Cherry Street. Many decades ago, the paintings were damaged in a fire, then damaged even further in a botched restoration attempt. They remained in storage in the church, where they might still be today. I photographed the paintings a few years ago for William Machen’s grand-nephew, James Machen, who lives in Toledo. We both hoped we could garner some support to have the paintings physically restored. 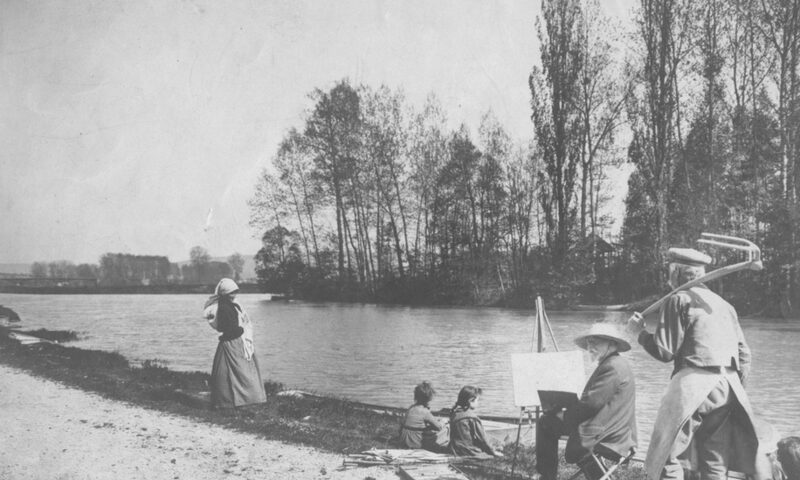 Finally, James Machen decided to take up the project of digitally restoring the paintings, and printed them on canvas. I am still working to get retouched canvas prints of the Machen Stations paintings placed in the St. Francis chapel. I did get Bishop Thomas’ approval of the plan about three months ago but the individual in charge was changed. He is slow to move on it, I guess. Good news! I finally got the go-ahead for the project of getting canvases made of the 14 “fixed” Station images. Msgr. Kubacki, who is now in charge at St. Francis, was very pleased with the sample I showed him. He decided to go with the 18″ x 24″ size. On the Stations restorations – – I’m all done. #1 and #14 took the most work. Also good news, Msgr. Kubacki gave his go ahead for the project. I want to update you on the 14 restored Station images which I had been working on. Earlier this year in March, I showed a restored sample canvas, size 18″ x 24″, to the bishop’s representative, and then to Msgr. Kubacki (now in charge of St. Francis chapel). Msgr. Kubacki was pleased and told me to go ahead with the other 13. I had them printed and delivered them to St. Francis in May. There has been a problem – – I haven’t heard a thing since the spring in spite of multiple tries to communicate with Kubacki on my part. The caretaker is eager to put them up, but hasn’t been given any instructions. The canvases were put in a storage area. Not knowing anything at all, and not wanting this project to end in limbo, I went there this week and retrieved all 14. I’m not sure what is going on, if it is intentional, they are too busy or ? Maybe they even plan to close St. Francis like St. Hedwig & Good Shepherd churches ? ? I delivered the canvases to St. Francis in May where Msgr. Kubacki is now in charge. I waited for several months without hearing anything. Finally I found out he felt the size was too small for the former spaces and didn’t use them. Good news – – through a mission organization, I’ve finally placed the 18″ x 24″ canvas printed from my retouched images of the 14 Stations. They didn’t want them at St. Francis de Sales, I guess partly because they didn’t fit nicely in the old niches. They are being shipped to a church in the Philippines that was damaged in the big hurricane they had. 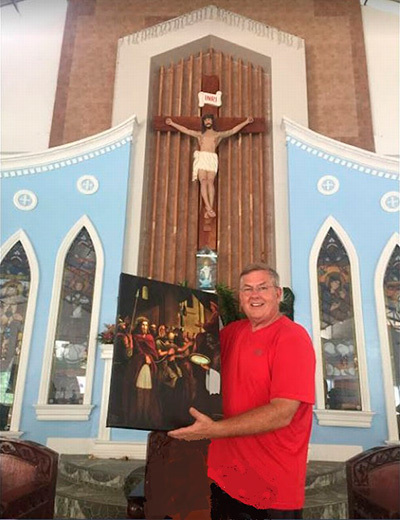 Attached is a jpg of a Station 1 copy finally arrived in the church in the Philippines. It was a long effort but now satisfying. I’m told that they are going to mount the Stations in frames.